Ships from and sold by smiling*bookstore. For upper-level undergraduate and MBA students enrolled in an international business law course. August emphasizes the diversity and similarity of how firms are currently regulated and governed around the world. 5.0 out of 5 starsExact same as most current version! Exact same as most current version! 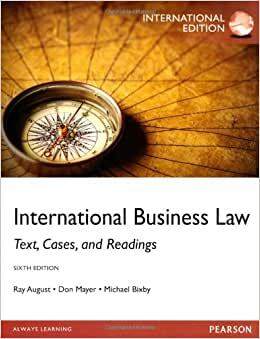 I bought this book for my International Business Law class for a fraction of the price of the required (most current) version. We followed along in the book for class and were required to get study material from the book, and I had no issues with either. I frequently compared my book to my classmate's newer editions and the books are essentially identical/word for word. The only difference was in page numbers. Very satisfied with my purchase! The book was an awesome buy, as it was in great condition. I would definitely recommend and buy from this seller. A good textbook. I found the information I was looking for my next course. 4.0 out of 5 starsGood intro. A good introduction to the legal aspects of international trade/foreign market penetration but I would have liked to see more detailed information.